For Mommy & Me we took learning on the road for a little fun in the sand! For a little quality mommy time I traveled with my little ones to the beach for a day trip just the three of us. I love getting to enjoy the beauty of our great state with my kids. I love watching them experience things for the first time. So hitting the road for a little beach trip was just what we needed. We live in the panhandle so the beaches are about a 1 1/2 hour drive which leaves lots of time in the car. One of my favorite games I like to have my daughter play is I spy ABC's. I give her a small ABC board book (from Target's $1 section). Nothing fancy just one letter per page. We start at the beginning and she has to read me the letters from the backseat. As she reads we work together to try to find something that starts with that letter, when we find it she gets to turn the page and start hunting for the next letter. For example she says, "A" , we look out our windows and around the car, she sees her Ariel Mermaid doll. She is only 4 right now so I have to help her along with the initial sounds. But by 6 this is something they will be able to do independently. It's a skill that will help your beginning readers recognize their letter sounds and enhance their vocabulary, and will also keep them occupied on those car trips which will help you keep your sanity on those long drives. 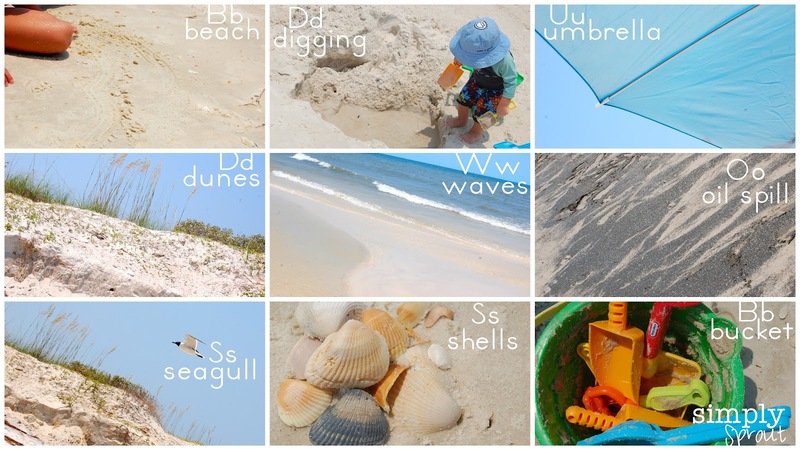 The Beach is such a great place for your kids to learn and explore. The beach we go to is a natural beach (no hotels) so it isn't very crowded. I can let my kids have a little more freedom to play. Since it's just me and the kids today there is no quiet beach blanket with a dacquiri and a magazine waiting for me....It's all up to me to keep them safe and entertained, so we decided to play a few learning games at the beach. They love to scoop the sand and haul the water and of course the drip castle making by the water's edge is a must. But I snuck in a few learning games as well. I guess you can't take the teacher out of me! We used our shovels and created a life sized alphabet on the beach. We played a couple of great letter recognition games. We went on a walk down the beach and Kaitlyn collected a bucket full of pretty shells. When we got back from our walk I drew two circles in the sand and asked her to sort the bucket of shells into two groups, small and large. We talked about how the waves pound against the shells making them smaller and broken and eventually turn into the sand we see on the beach. She even collected a few with holes in them perfect for a beach necklace. My almost 16 month old son loved all of his new found freedom at the beach he loved chasing after the waves and splashing around in the water. We worked a little on building his vocabulary, I would hand him a shovel and say "shovel", a bird would fly by, "bird", I would say. The more you talk to your little ones the faster their vocabulary develops. Their little brains are like sponges, so ready to learn something new. Enough can't be said for a simple bucket and some shovels at the beach. My daughter's imagination took flight. She made sand pancakes, sandcastles, rocks and dug "pools". And of course my little one was just content to dig a big hole and sit in it. It's important to have children use their imagination when playing it helps them to understand the world around them and to relate to their peers and to adults. Going on a walk is the best way to explore the beach. We took the camera and Kaitlyn pointed out things that she saw and we took pictures. She found shells and seagulls, dolphins and even a sea urchin. She tried to take me up on an offer for some ice cream if she could pick up one grain of sand....lets just say she didn't win! Going on a walk with your young ones is a great way to build vocabulary especially when visiting unfamiliar places. Having a rich vocabulary is really helpful once they enter school and they are beginning to learn to read and write. Since we are still just working on letters we decided to make a beach ABC book when we returned home. This is something that is super easy to do with your kids and will have them reminiscing about their trip long after the return home. This will be a great way to practice their letters and their new vocabulary long after the sand has fallen off their toes. Enjoy your summer and take some time to explore with your little ones!